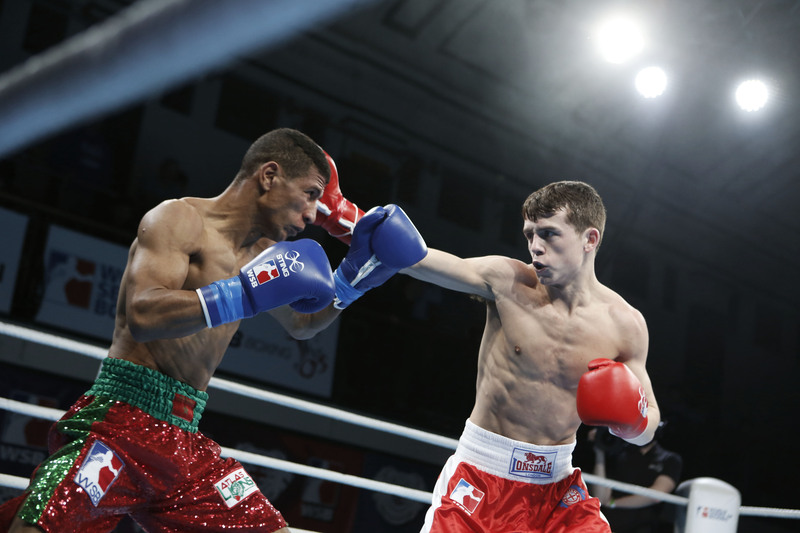 THE British Lionhearts made a triumphant return to York Hall tonight with a 5-0 victory over the Morocco Atlas Lions in the team’s first home fixture of the season in the World Series of Boxing (WSB). It was the Lionhearts second consecutive win after starting the season with a narrow defeat in Italy and leaves the team well placed to make it through the group stages of the competition with two home fixtures coming-up next against Italy and France. The evening began with an easy night’s work for Rio Olympian Galal Yafai, who saw his opponent, Yassine Zaher, disqualified in the first round after twice losing his gumshield. Hungarian middleweight, Zoltan Harcsa, extended the Lionheart’s lead with a unanimous points victory over Youness Gharroumi to make it 2-0. He was followed by Liverpool’s Peter McGrail, who secured the match with a comfortable win at bantamweight, delivering a trademark performance of elusive footwork and fast hands. A WSB debut win for Connor Loftus made the scores 4-0 as the Leeds boxer overcame Youness Baati in a hard fought contest. It was the first time Loftus had boxed at light-welterweight (64kg) having moved down from welterweight (69kg). Croatian heavyweight, Bepo Fillipi, completed the whitewash with a victory over Abeljalil Abouhamda in a bruising final contest to send the Lionhearts home with a 5-0 win and maximum points. The team will return to York Hall in two weeks time to take on Italia Thunder on Thursday 23 March 2017 when they will be looking to avenge the 3-2 defeat they suffered in the season opener in Rome. Full details of the scores of all of tonight’s bouts are at http://www.worldseriesboxing.com/matches/wsb-season-vii-week-6-british-lionhearts-vs-morocco-atlas-lions/.